GitHub - donejs/donejs-streaming-product-page: A product page that is super streaming fast! A product page that is super streaming fast! Want to be notified of new releases in donejs/donejs-streaming-product-page? 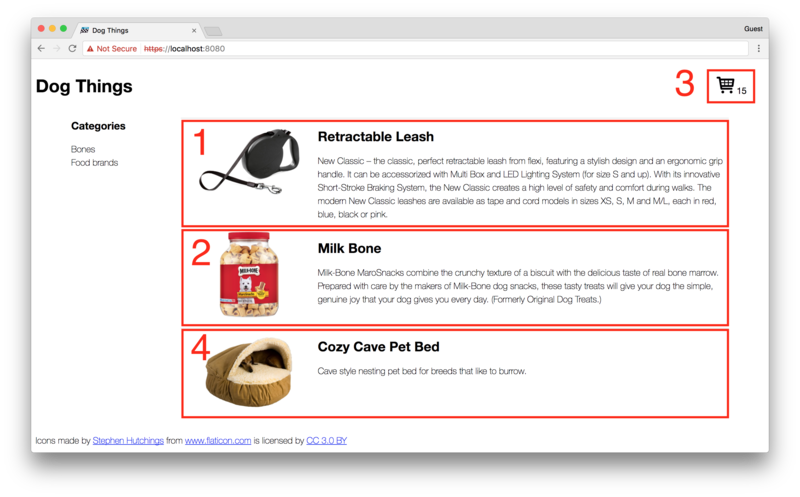 Dog Things is a DoneJS application that allows users to view dog products like leashes and bones, and to add items to their cart. This application shows off the advantages of streamable web applications and how DoneJS facilitates building them. This readme walks through getting the project set up locally, and the features used to build the app. And then install the dependencies with npm. 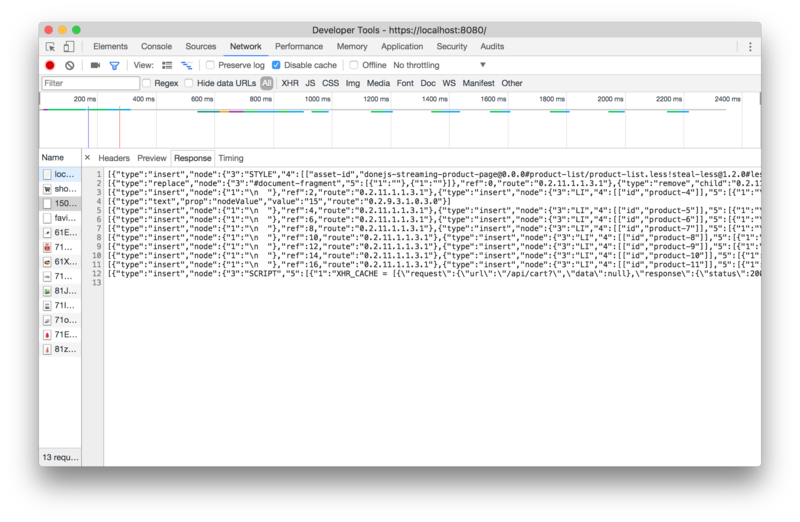 This application uses HTTP/2 to provide the fastest possible rendering. HTTP/2 requires SSL, so to debug the application locally you'll need to first create a self-signed certificate. This will create a server.key and server.cert file in the local directory. Since you don't want to include these in version control, move them somewhere else in the file system. I keep a directory for these certificates so that I can reuse them when working locally. 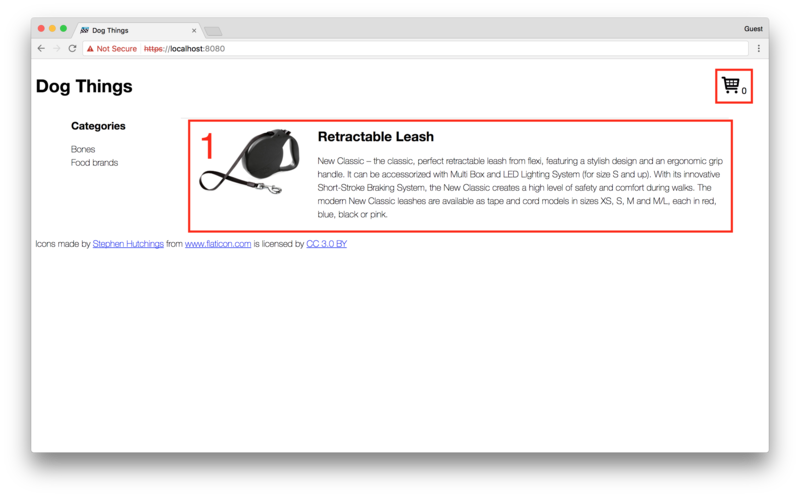 "develop": "done-serve --develop --port 8080 --proxy http://localhost:8084 --key ~/.localhost-ssl/server.key --cert ~/.localhost-ssl/server.cert --strategy incremental"
And open the page in the browser at https://localhost:8080. 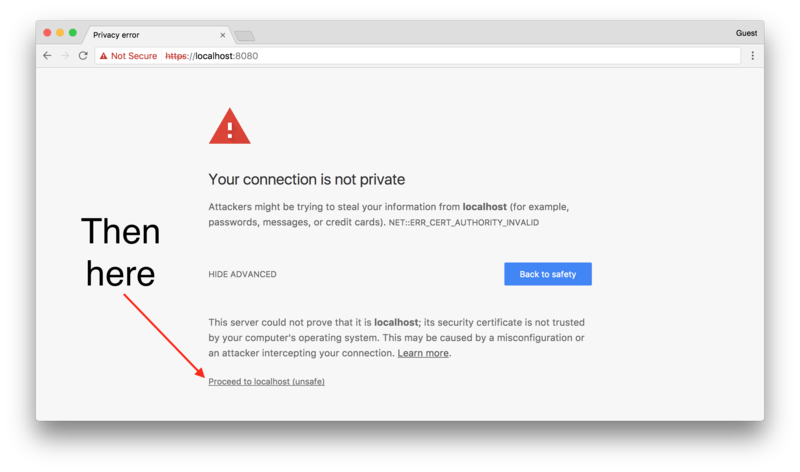 The first time you open the page you will get a security error because the certificate is not signed by a CA the browser recognizes. Since you are using this for local development you can ignore this error, it will only happen the first time. Which should load up the app. This demo application shows off some of the streaming capabilities of DoneJS. 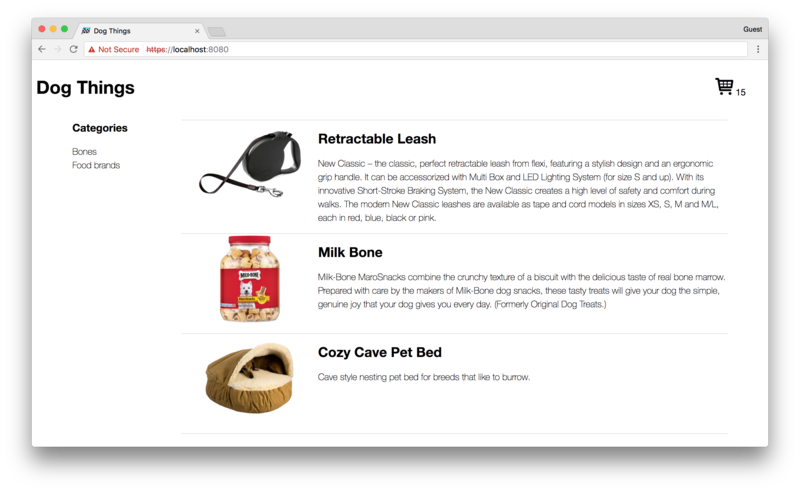 DoneJS utilizes HTTP/2 and the fetch API to stream data from the server. Incremental rendering is a term we have come up with to describe a new streaming technique we've invented as part of DoneJS. Since most applications are made up of various dynamic parts, waiting for everything to load before rendering will result in a poor experience for your users. With the incremental rendering strategy DoneJS can provide many of the benefits of server-side rendering without forcing your users to wait on the slowest part. Notice that the cart shows 0 items. This is because the cart is still being loaded on the server. Meanwhile 1 product has already loaded. When implementing a traditional HTML streaming approach you would have to wait on the cart to load before streaming out any other content below it. Incremental rendering isn't biased in favor of top-down loading, so the fastest parts of your app load first. This mirrors what happens in the real world, where often times something like a product listing will load fast from the database, and user profile things (that tend to be at the top of the page, like the cart) might require more complex database queries. The numbers demonstrate the loading order. First 2 product items load, then the cart, and finally more products. Notice that this utilizes an ndjson property on the connection. In this case it is the same url as used for JSON, but if you wanted you could use different URLs. This would allow you to use ndjson streaming data for users with supported browsers and then to fallback to a JSON service for those that do not.